Puzzle Plunder is a Pirate themed match 3 game with stat building elements. Connect and match the icons to overcome obstacles as you sail the vast ocean in search of loot. New game from Windybeard - RagTag - OUT NOW! Hey Puzzle Plunder fans, check out my newest creation RagTag! Hey everyone! 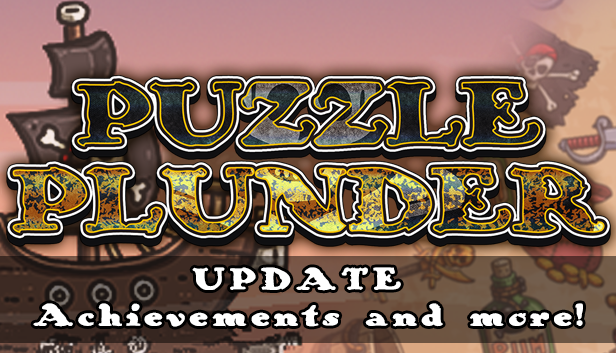 I just uploaded a major patch to Puzzle Plunder! Please enjoy the new fixes, changes and additions! And thank you for supporting my work! Purchasing medallions is now fixed, you will get the quantity shown. I hope you enjoy this patch and please consider purchasing the support dlc if you enjoy the game. Thank you and have fun! Match swords to fight monsters. Collect buckets to stop your ship from sinking. Match keys to open chests. Use your hard earned loot to upgrade your ship. Use your new found powers to sail further and find MORE loot!